The roadmap for mobile is a lot easier to read through than the desktop one. There aren't as many competing products within a given price class. I've put together the Q3 2010 - Q3 2011 mobile CPU roadmap below, but I've left out the value segments. Sandy Bridge won't make it down there until late next year at this point, so Celerons are off limits for now. If you're an Apple user the parts you'll want to pay attention to are the 2620, 2540 and 2520 - these will likely be in the next 15-inch MacBook Pro. Clock speeds are up slightly compared to what Apple is shipping today, which means you'll probably see at least a 10%+ performance improvement across the board. I'd expect that number to grow to as high as 15 - 20% depending on the application. I don't believe Apple will abandon NVIDIA as a result of Sandy Bridge's vastly improved graphics given SB's lack of OpenCL support. 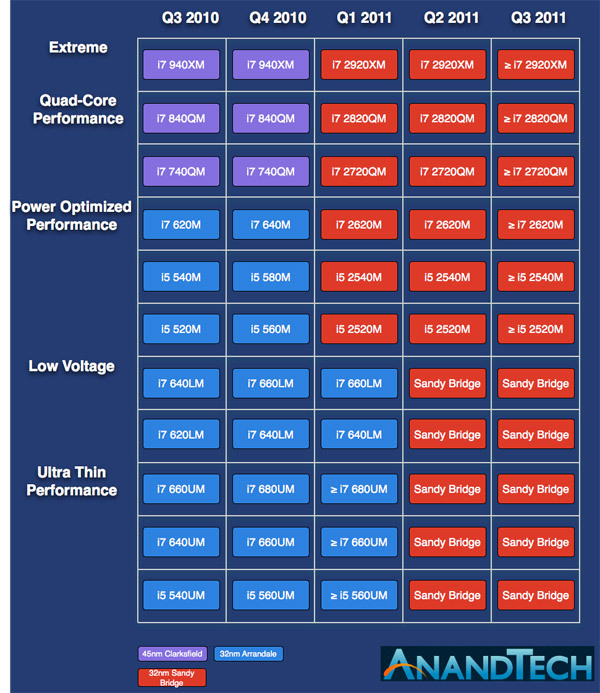 Sandy Bridge looks to be very capable, both on the desktop and mobile side. Both CPU and GPU performance are much improved, the latter particularly in notebooks as all launch mobile Sandy Bridge parts will ship with the higher end 12 EU configuration. Intel is clearly going after the low hanging fruit in the GPU market, though I'm curious to see how far upstream Intel will push its advance. It's not very hard for Intel to more than double integrated graphics performance. The question is how will it compare to AMD's Llano, a part that will undoubtedly have a competant GPU but a CPU core based on AMD's Phenom II architecture. 2011 is going to be an exciting time for the semiconductor market. Holy crap. It doesn't make sense, but 650/1300MHz with 12 EUs seems amazing on mobile. I'd WAG the 650/1300MHz IGP is clock speed equivalent to a 1.1GHz "stable" frequency GPU, while the 850/1350MHz on desktop is equal to 1.25GHz. The difference is that the mobile space has a lower power threshold to hit; and Intel would like to muscle discrete GPUs out of the equation completely in both the low end and midrange. So by offering such aggressive turbo (plus all SKUs having more EUs,) they make it more likely that midrange systems will forego discrete GPUs. For example, we may very well see Intel integrated graphics as the standard, even on the highest-end Apple products; with a discrete GPU solely as an additional-cost option. In the mobile space, you can trade off CPU power usage for GPU power usage more readily. On the desktop, you don't need to do that nearly as much, with the greater power envelope, combined with the reasonably common acceptance of a low-end discrete GPU on mid-range systems. For the majority of games, even two CPU cores aren't running at full load, so the CPU half could run at stock speeds, possibly even idling one or two cores on the quad-core parts, while the GPU could take up all the power headroom to boost itself up all the way. Once you're back at your desktop doing some video compression, though, the GPU can drop to idle, and all (potentially four) cores of the CPU can take all the power they can muster to get that over with. Now, if you play a game that will fully stress all your CPU cores *AND* your GPU, though... And you end up with a mess. You don't see a full-fledged Geforce GTX480 on a laptop because the thermals don't allow it. If you are giving a faster product on a mobile variant it just means your desktop part is crippled and not showing its full potential. They can't take such a chance when Llano's GPU is rumored to be substantial. They need all the advantages they can get. About Turbo: I think its too early to judge how it'll do on CPU-intensive games. If implemented well it can work pretty good. The Turbo driver for graphics on Arrandale has a frame rate counter. If they can see that boosting the GPU works better than CPU it can be programmed so GPU Turbo kicks in more often. A game that is fully stressing both the CPU and the GPU belongs to a gaming rig (or a gaming laptop), not to a laptop. 740/840/940 wasn't a refresh. It was a rebadging of the kind we hate Nvidia for. It was just a redrawing of the lines between speed bins. They are EXACTLY the same chips as were used in 720/820/920 just with a 1x higher multiplier across the board.